Since the very first season, Starz Spartacus has been a showcase for fascinating female characters and for the actors who play them. 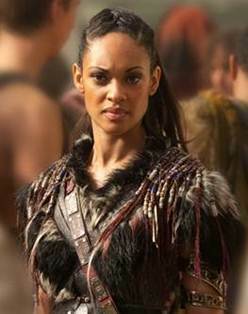 Cynthia Addai-Robinson as Naevia in Spartacus: War of the Damned, copyright Starz Entertainment. I conducted interviews back in January with Cynthia Addai-Robinson (Naevia), Anne Hutchinson (Laeta) and Ellen Holman (Saxa) just before the Spartacus: War of the Damned premiere. Now that we are just two episodes from the end of the series, I can see how they each avoided spoilers about the fates of their characters. Still, hints about what happens can be found by looking back at what they said. Naevia and Crixus’ (Manu Bennett, now being seen on Arrow as Slade Wilson) tale has been woven through all the show’s seasons and one could make the argument that while Spartacus has the title billing, the show is about their tragic coupling. It’s certainly been one of the best love stories on television over the last few years. “Crixus is the light at the end of the tunnel for her,” Addai-Robinson said during the interview. And that has played out during the season, as the lovers were united in their quest to make Rome pay for what was done to them and theirs. While Agron ordered his male lover to stay with Spartacus and live, Crixus and Naevia stayed together to fight the Roman army in what they knew might be a suicide mission. Ellen Hollman as Saxa in Spartacus: War of the Damned, image copyright Starz. For Crixus, it was. He was beheaded by Tiberius, who now joins Asher as the series’ nastiest piece of work. Naevia appears to be still alive, though I can’t see how she will want to live without him. But there may be some small slice of hope. When I expressed concern in January about the eventual ending for the lovers, Addai-Robinson said their ending was bittersweet but may leave room for some “positives.” “At the end of the day, it’s a television and there are some surprises.” Does that mean Naevia survives to tell Crixus’ story or even bears his child? I’m looking for a silver lining. At the least, I hope she gets to kill Tiberius. Of course, she will be in line behind Caeser. As Hollman predicted in January, Saxa has truly turned out to be a hurricane. As fierce a fighter as any of them, she shared Gannicus’ taste in wine and women for much of the season until her lover turned to a quieter woman of faith. What is next for Saxa, I don’t know, but I hope she lives to make it across the mountains and has a future making life difficult for Rome. She should be a queen. However, it’s been Laeta who has had the biggest character change of all of them. She began the season as a Roman woman whose husband was killed by Spartacus. After the first few episodes, I wondered if she would even survive long. But Hutchison hinted that her character would have a long arc. That journey led to Laeta’s growing relationship with Spartacus and, after she’s sold off by Crassus’ as a reward to the pirates who betrayed Spartacus and allowed his men to retake a Roman city, Laeta learns what it is like to be a slave. 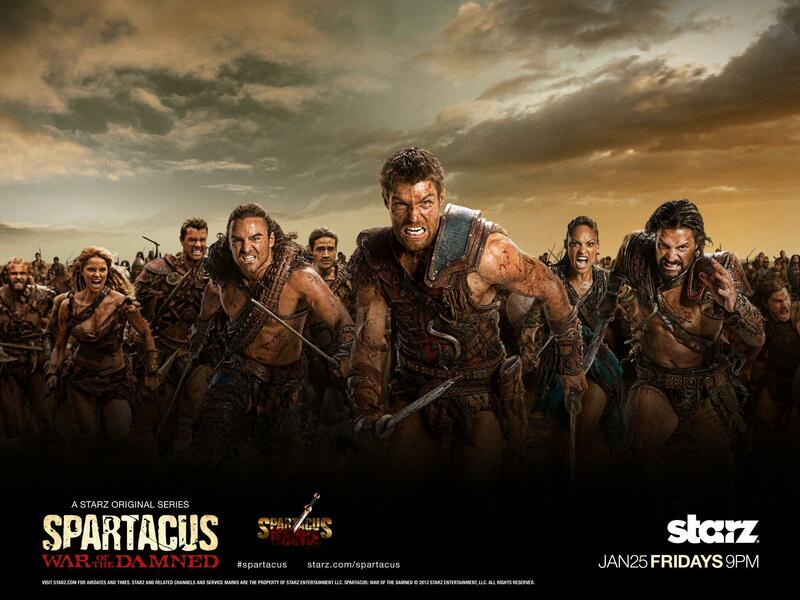 She escapes captivity, joins Spartacus’ rebellion, and, in the last aired episode, became Spartacus’ lover. All three women–Naevia, Saxa, and Laeta– are all still alive and kicking with two episodes left. Naevia, along with Spartacus, is one of two survivors from the first season. I suspect all of them will not survive. But I’m still hoping to be surprised!